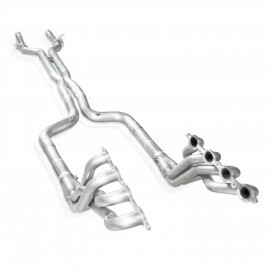 2016-18 Camaro SS & LZ1 Longtube Headers - available with 1-7/8" or 2" primaries, catted or off-road, and choice of AFM valve or valve-delete. Does not fit convertible. These 304 stainless steel headers are TIG welded with 3/8" thick flanges and 3" diameter slip fit collectors with merge spikes. You get superior performance with a lifetime guarantee. From port-matched flanges to our slip-fit leads, our headers easily align to your existing factory connection point. Our Camaro SS System includes adapters for both Factory and Performance connections, making it easy to install whether you have the stock exhaust or our Stainless Works Performance Exhaust Systems. Our leads include either full valve support or a valve delete plate that allows you to mount the electric motor and alleviate any AFM engine codes on the dash.